The mouth-piece of Jharkhand - A Journal with a difference devoted to the study and promotion of social development and change. The Department of Research and Publications (R&P) of XISS was established in June, 2002. It has now completed more than ten years of its existence in the Institute. The first and foremost goal of this departments was to bring out a Research Journal titled “Jharkhand Journal of Development and Management Studies” (JJDMS) in the context of reconstruction and transformation of Jharkhand and its population in general, and ‘reference groups’ in particular. The justification of the publication of ‘JJDMS’ through XISS is further concerned with an aim to provide to young professionals, academicians, and policy–makers the raw materials for the study of social processes and to reveal intended and un-intended consequences of specific social action to the common man by ‘putting the last first’. This may add to the documentation on the nature and impact of social action of XISS in the specific time and space dimension. 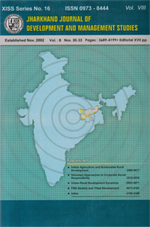 The materials thus, used in this Journal may be valuable to the NGOs and the government of Jharkhand seeking solution to social problems of their own predicament in the different geographical area. The objective of the Department of Research and Publications is twofold: (i) to conduct research studies independently, and (ii) to document and publish the baseline realities after a good deal of field work. The idea behind these objectives is to offer a platform to the academicians, field workers, students and social activists at large for sharing their views on research, planning and programmes. However, the specific objective of the department is (a) publications of academic Journal and text books, and (b) teaching, organizing seminars, and workshops, etc.